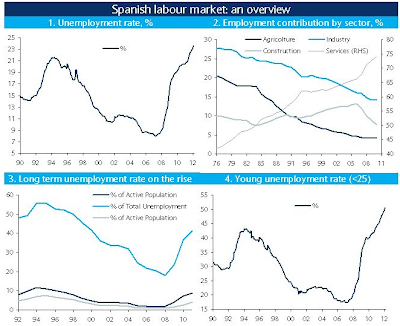 Mish's Global Economic Trend Analysis: Depression in Spain: Unemployment Rate Up .5 Percentage Points to 23.6%; Expect Much Higher Rates Later This Year; When is the Breaking Point? Depression in Spain: Unemployment Rate Up .5 Percentage Points to 23.6%; Expect Much Higher Rates Later This Year; When is the Breaking Point? Via email from Barclays Capital, Spain: Q1 unemployment rate rises; trend likely to continue into H1 2013. This morning Spain released labour market statistics for Q1. Seasonally adjusted, the unemployment rate rose to 23.6% from 23.1% in Q4 last year (Figure 1). We think that the labour market's deterioration is likely to continue over the next 3-4 quarters. We look for unemployment to peak at nearly 26% in H1 2013, before slowly starting to decline. Beyond cyclical lags, the Spanish labour market trend, to a large extent, is a reflection of the hangover from a boom-bust in the construction sector, which for many years has been an important source of employment growth (Figure 2). It seems that the adjustment in the construction sector's employment is close to an end: it now contributes c.10% to total employment, in line with the long-term average pre the housing sector boom. However, we think that the unemployment rate is likely to stay elevated for a while and that it will decline only slowly as the economy likely starts to grow in H2 2013. There are at least two reasons for our view: 1) fiscal consolidation will negatively affect consumers' spending, economic activity and consequently employment; 2) As we pointed out in Spain: Assessing the fiscal and labour market reforms, we think that Spain needs better "active labour market policies" that can address long-term unemployment (Figure 3) and the retraining of young (in some cases) low-skilled unemployed workers (Figure 4). It is difficult to know precisely when Spanish unemployment stops going up. I see no reason it cannot hit 28% or even 30%. Spanish politicians (for now) remain insanely committed to the Euro. How long the citizens remain committed to the Eurozone is another matter. When is the Breaking Point? 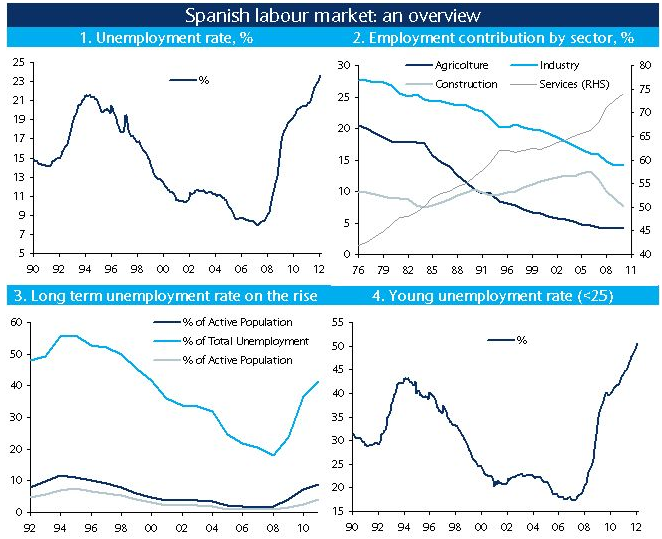 Will the general population of Spain put up with an unemployment rate of 28%? 30%? I think not, but I do not know the precise breaking point. Whatever it is, Spain has little chance for growth prospects for a decade as long as it remains in the eurozone. Eventually will come a time when a politician will hold up a copy of the EMU treaty, declare it null and void, and the debt null and void right along with it. That politician will be elected. Spain will be better off as soon as that happens.